A letter of resignation is a must when you are about to formally announce your resignation to your employer. You generally inform about the resignation in person and then send the letter for a documented proof. The letter declares your last date in the office and some of such letters also cite the reason behind the resignation. Are you too planning to resign from your current office? Well, if you need guidance on framing a standard letter, there are readymade Sample Letters on the said theme online. 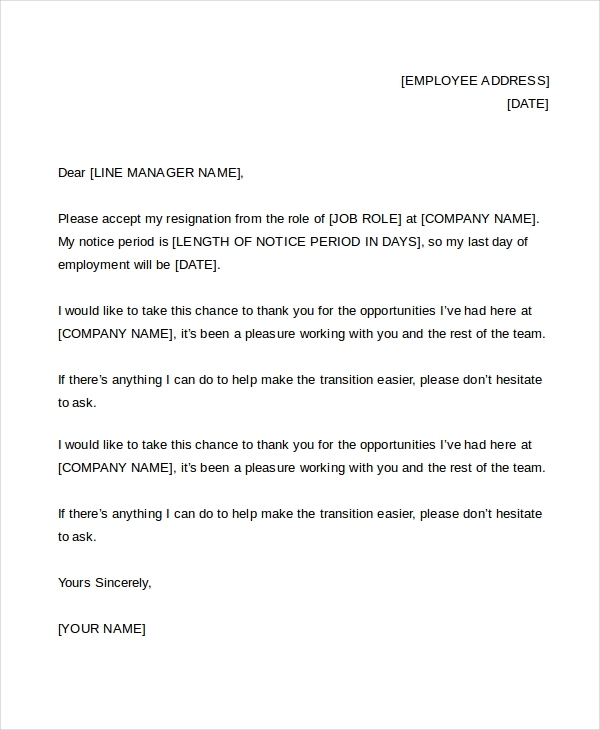 This is a standard letter of resignation which clearly states about the length of notice period and the last date of employment of the employee. It concludes with thanking the company for opportunities received. If you need help in the format of 2 weeks notice resignation letter, this is the format for you. It begins with a very polite greeting from the employee informing that about his resignation. 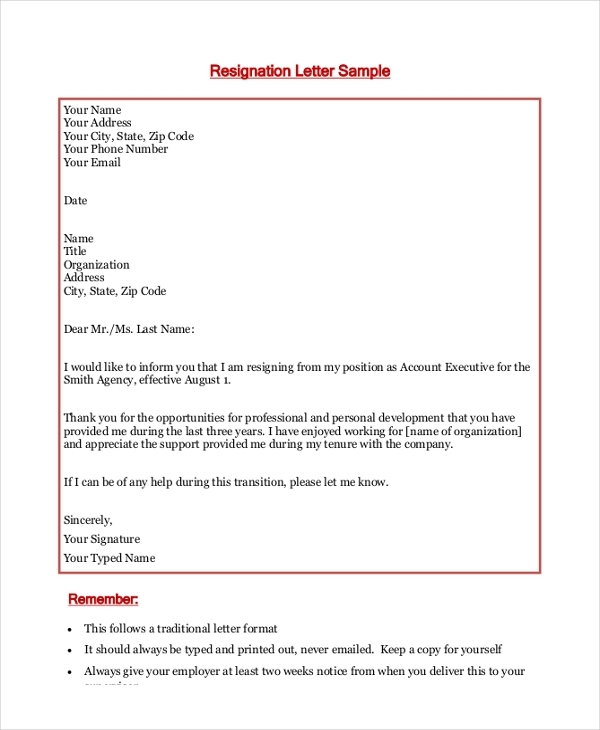 If you are looking for a letter of resignation that will enable you to detail about the reason for leaving the existing company added to informing about the resignations- this is the sample for you. The resignation letter here comes with a whole list of possible reasons for resignation which you have to tick as per your specific circumstances to let the employer know – that why you are leaving the team. 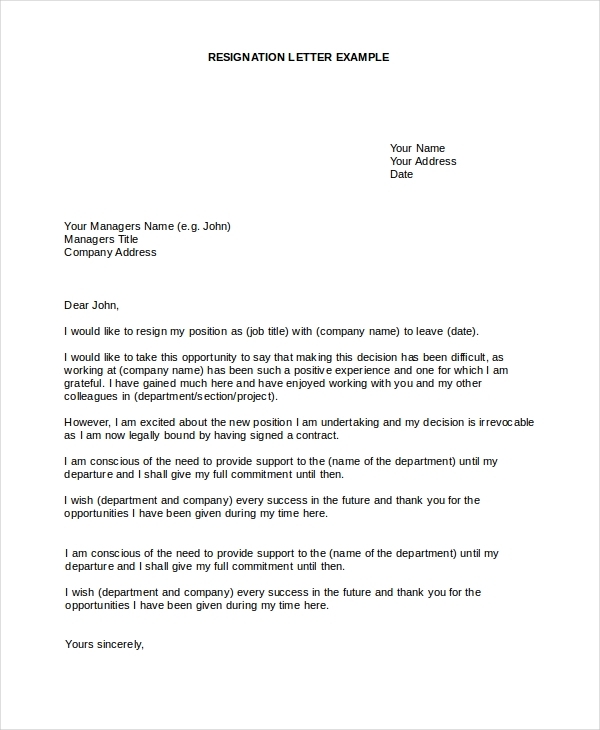 If you are about to leave the existing company for a preferred position in another company, this formal resignation letter would be of great help for you. It ends with thanks for the opportunities received while working in the organization. 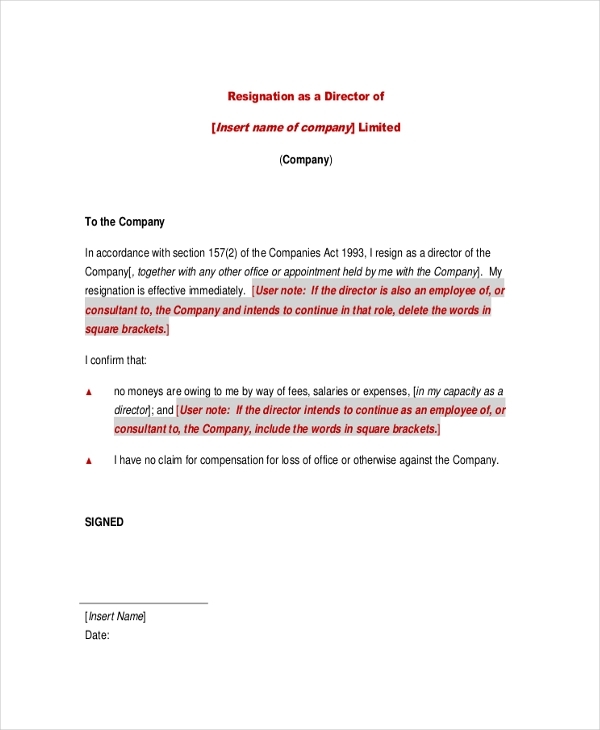 If you are resigning as a director of a company, then this letter offers you the guide on how to draft and what to include in the letter of resignation of a company director. 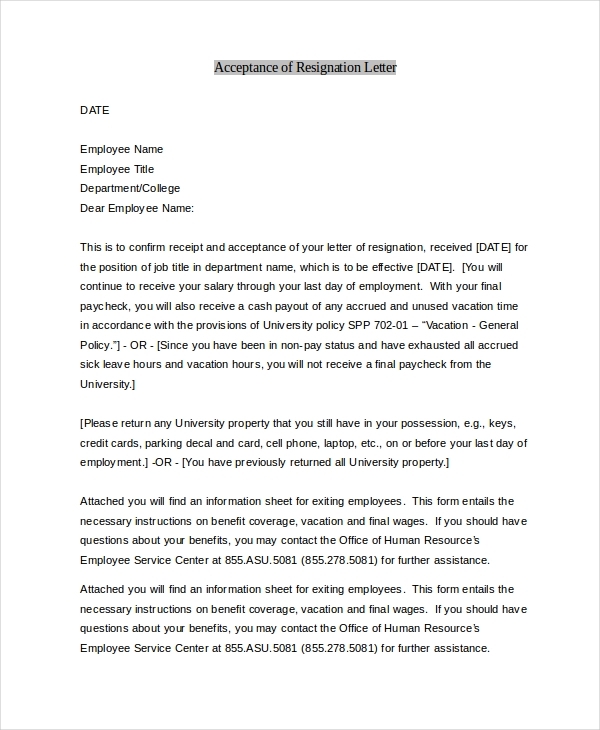 You are getting a standard format of letter defining the acceptance of resignation as sent by an employee. The letter also states that the employee would continue to receive his salary till the last date of his employment. 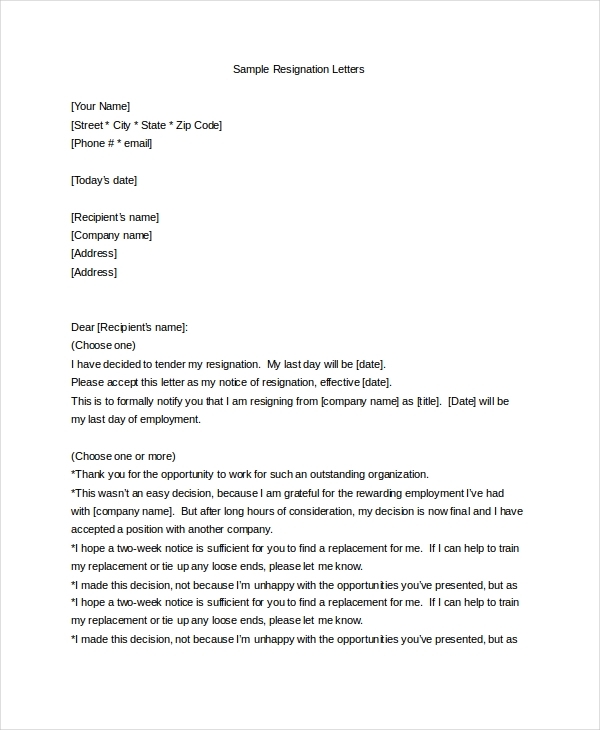 If you are leaving your company to join a newly found position in another company, this letter here would help you with the right words and format to draft your resignation letter. 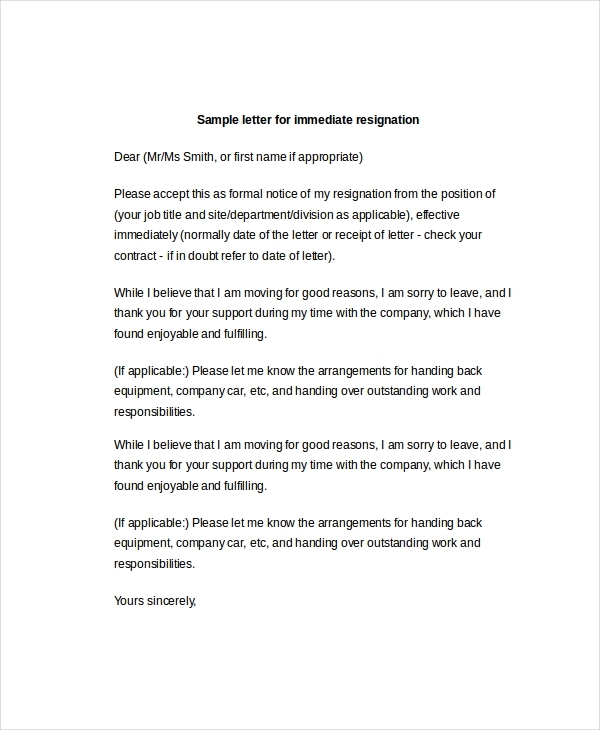 You have two sample resignation letters here- one would be helpful if you want your resignation to take effect immediately and other would be handy when you have to submit the letter before notice period. 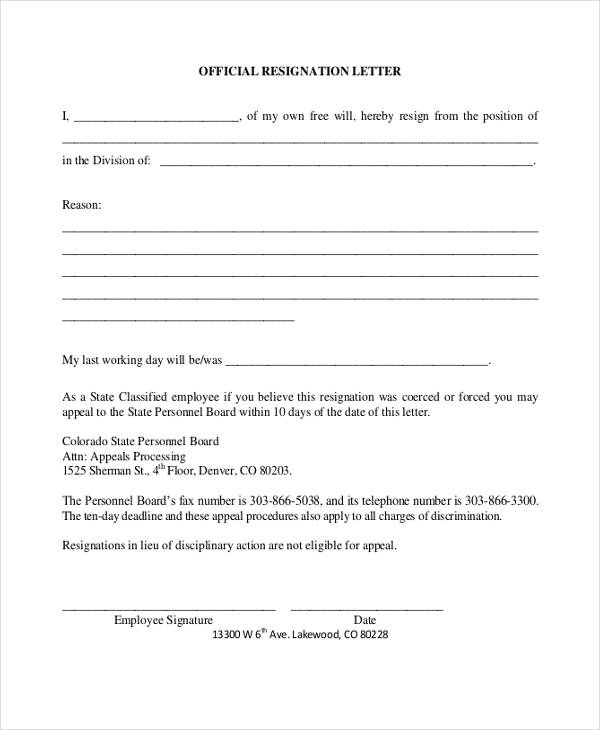 What is The Purpose of Letter of Resignation? The main purpose of the letter of resignation is to clearly specify that you are about to resign from your current position from your present company. The letter helps the employer to understand from which date you won’t be working for the office anymore so that he can arrange for a suitable replacement. Besides, resignation always carries a bitter tone with it, especially if it’s the resignation of a valuable employee. Thus, another big purpose of the resignation letter is to make everything formal with a polite greeting and express of gratitude from the employee for the great time he had in the office. You can also see Formal Letters. What are The Tips to Write Letter of Resignation? Writing a resignation letter is no rocket science but then you have to be very careful about certain tips here. Even if you are leaving your company on a bitter note, do not forget to start your letter of resignation with courteous greetings. Then, you must be straightforward about your last date in the office and the notice period, if needed. Besides, if the reason of resignation is not too personal or hurtful, you can mention the reason. Don’t write about any negative experience and make sure to stress on the positive moments and the great opportunities you enjoyed in the office. You may also see Recommendation Letters. When it comes to writing a resignation letter, you have to be really proper as your impression here would decide the fate of your recommendation letter from your employer. 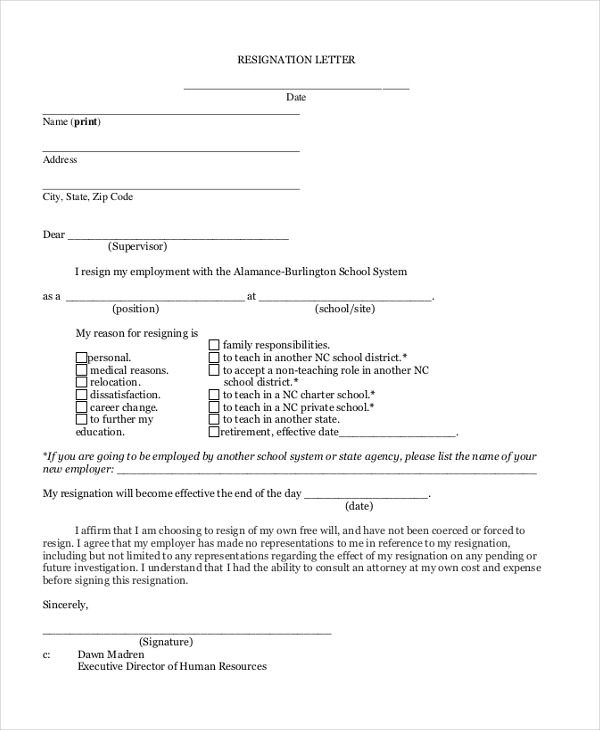 However, if you are writing such a letter for the first time and are eagerly looking for help, there are resignation letter samples online, just as you have cover letter examples for your resume.